We had a great time planning and then planting our new garden bed. There's really nothing different about planting in this bed than other types of garden beds except you need to move aside the very thick layer of wood chips to get to the soil beneath. To plant seeds, we just moved the wood chips away to expose the soil underneath and put our seeds in the row. I watered this whole area really well 2 days ago and the soil was still very moist when I pulled the chips away. I expect this to be a very low water garden. We can't wait to keep you posted about how this works out for us. As Gidget surveys her property, she becomes more disgusted. She thinks we could have at least 1000 chickens. I have been on what I think most people who aspire to have big gardens would consider a high point in their effort. We brought in enough cardboard, growers mix and wood chips to cover about 575 square feet or 25 by 23 feet with at least 8 inches of material. This is more space than I have ever had to play with at one time. I was feeling like there is so much space that I'd never figure out how to fill it all. Now I'm feeling silly for feeling that way. I needed to take a minute to plan the space as wisely as possible for the health of the plants and for the best production. The goal at this point is to have enough produce for us to eat and also start selling it at the farmers market on a regular basis. I decided I needed to put it all on paper before moving forward. There are some great planning tools that you can download for this purpose but a piece of graph paper and a pencil work fine for me. I would suggest doing this in any size garden you are planning because it's easy to erase and start over before you actually start putting plants and seeds in the ground. Once you take the hugelkultur mound out of this equation and consider space around the edges and walkways, the area becomes a little less than 410 square feet of actual growing space. My abundance of space is looking smaller and smaller by the minute. Planning how much of what to put where is not the only benefit to planning like this. It will also help you keep track of what has been planted where in previous seasons so you can rotate crops to help reduce disease and pests. I've laid this out so my tallest plants will be on the west side of the garden so they won't shade the other plants. I've been able to determine beforehand how many of each plant will fit and the space that will be needed between rows to keep the plants happy. I'm not going to be able to plant as much as I wanted but I'm glad I went through this process before learning that the hard way by way of unhealthy plants that produce poorly. The section to the east of the walkway has not been planned yet but our cooler season vegetables like broccoli and cabbage will go there in September. Now, I can move forward and start the actual planting with confidence. Siemer and Sons Gardening Service and a girl Siemer came this afternoon and got all of the soil and wood chips moved for our Back to Eden style garden bed. We are so excited! Not only did they do an awesome job but we really enjoyed our time as friends too. One of our acquaintances mentioned we may still have weeds coming up after this process and I wanted to address that concern quickly here. While we have never done exactly this type of garden before, we have done some very similar things to choke out all weeds, including crab grass and other noxious weeds. The key is to make sure that you prepare well beforehand. When laying out cardboard you must make sure to overlap the edges and I even went as far as to lay down a few layers of newspaper in between the cardboard pieces underneath so not even a tiny bit of earth was showing. The weeds will not get the light they need and the area should have too much nitrogen for them to grow up from underneath. Weeds go with gardening. We could spend hours debating what a "weed" is. The invasive ones will crawl up and over from the edges so you have to be diligent about pulling weeds around this type of bed. Also, the wind and your feet will carry weed seeds into the garden so you do have to pull those weeds as soon as you see them coming which will be easy in this loose soil if you do it regularly. There is no such thing as a completely weed free garden but I expect this one will be easy to manage. The Siemers arrived with their glorious tractor and turned what would have taken us a month to do into a few hours work. Laying out the grower's mix first. We covered the hugelkultur with some fresh soil too. I was very impressed with the tractor and if someone gave us one, I certainly would not turn it down. Until then, The Siemers are an excellent crew and I hope they'll be willing to come back if we decide to expand on this. We're going to try it for awhile to see if it lives up to our expectations, which I admit are high right now. Maybe because I am high on soil dust. The first layer of wood going on the beautiful soil that the crew spread out perfectly. Almost done. Goodness. It's hot out. I think this was the final load. I'm going to have to post a part 3 to this series because I haven't had the time to plan beyond this. I feel like this seed was planted and grew so quickly that now I need to take a second. This is the biggest blank canvas we've ever had at one time. It's only 23 x 25 feet but we've been urban gardeners in the past. This is a nice spread. I need to thank my dear friend and lifelong mentor, Sandi Repetowski, for sending me an email about this concept. She thought I might be interested in exploring it further and I was. I watched the movie on my laptop and immediately started praying about how to get it started. I have never seen anything that made more sense to me as far as creating a healthy environment for plants. Not that I'm an expert but my intuition was all tingly. Two days later, we received an email from someone who wanted to buy green pecans and everything just fell perfectly into place. I can't wait to keep you posted about how it goes. Gidget doesn't seem disgusted by the idea. Hipster is cool with everything but a little surprised by Gidget's indifference. We watched the movie Back to Eden and fell in love with the simplicity of this gardening method. We have already had success with the same type of concept in our lasagna garden bed so why wouldn't the idea work on a larger scale? This method goes right along with my intuition about how to make plants really happy. Instead of passively composting in small beds, we decided to go for the gusto and have some growing mix brought in from Lone Star Mulch and Compost. The concept is extremely simple which I think makes some people skeptical, including myself, but I'm willing to try it and see. You put down cardboard or newspaper over your existing mess, no tilling needed and then add compost, growing mix or just plain wood chips on top of it. The cardboard chokes out the weeds but will break down over time. Depending on how long you want to wait you can start planting right away in grower's mix, wait a few months if you use straight compost or in the case of using just wood chips, you can wait a couple years while they break down before planting. It depends on the materials you choose to use and how quickly you want to start planting.. The benefits are that you don't have to till your existing soil, the wood chips create an excellent mulch so you use less water and you don't have to add a lot of fertilizers because you always have organic matter breaking down to feed your plants. The main example in the movie is a man who lives in the pacific northwest so our climates are dramatically different. We will have to wait and see how well it works for us. We are using growers mix that is ready to plant in with a layer of wood chips on top. The only thing we should ever have to add moving forward is more wood chips as the initial ones start to break down and become a part of the soil. We will move the layer of wood chips to the side and plant in the growers mix. Planting in the wood chips themselves will not work but having them on top of the surrounding area will be the perfect mulch. When weeds makes their way in, they will be very easy to rake out because they won't be in the hard packed soil. We could have done a number of different things but I want to test this out for a fall garden so this is the way we went. We are covering 23x25 feet for our first attempt. If it is successful then we may do more. I got started today by laying out the cardboard and securing it from wind gusts with a little of the growing mix we had delivered. I thought we had plenty of cardboard after saving it for months but we didn't. I knew my neighbor gets the paper so I relieved him of the pile he had in his garage and was able to cover quite a bit with those but that's not as easy as using larger pieces of cardboard so I went and got some more from Elgin General Store and Blackland True Value. I had some old weed block on hand so I used that along the edges to keep weeds from creeping in. If you are going to do this, I suggest having more cardboard on hand than you think you'll need so you don't have to go hunt more down before you can proceed. I did as much as I could before the heat chased me away. I'll go out later, after it cools down a bit, to lay out the rest of the area. We are hiring a local landscape company, Siemer and Sons Gardening Service, to move most of the material. They're coming tomorrow with a tractor so the rest should go quickly. Gidget continues to be disappointed in our efforts and reminds us that cats cannot live on vegetables alone. We'll show you the second phase soon! Thanks for reading. I am a terrible garden writer as of late because I haven't posted anything about our adventures this first full season in central Texas. It's been a wonderful year here and I'll try to get you up to speed without boring you too much. The rainfall is still well below average around here but we did get more this year than last and we had about 8 inches in June alone so that really helped keep the plants healthy and happy. We started out in March with our tomatoes, peppers, corn, pumpkins, watermelon, cucumbers, sunflowers and a few other things. Everything is doing well but the summer garden is almost finished already. We have enough produce to share some with the mail carrier and our neighbors but not quite enough yet to make it worth going to the farmers market. 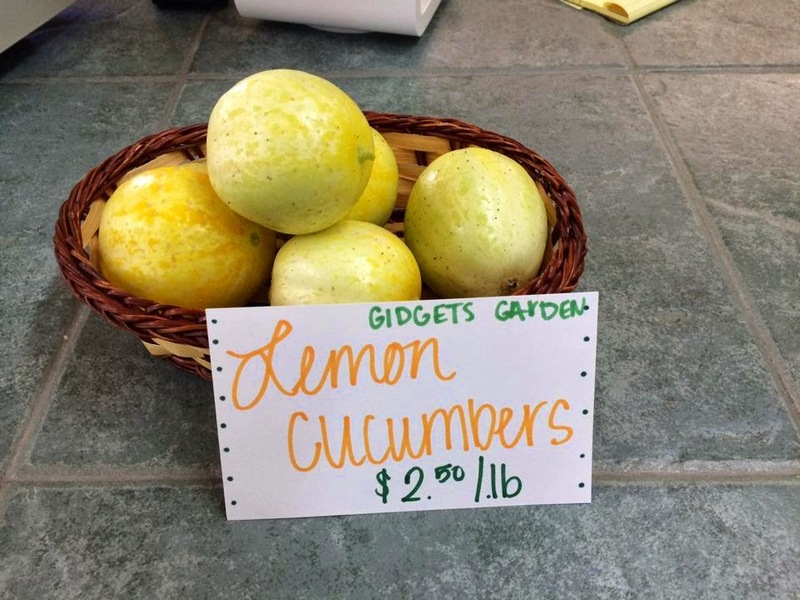 We have been selling some of our lemon cucumbers to the fantastic new grocery store in downtown. Elgin Local Goods is a place where growers and artisans can sell their local produce and goods. Consumers can buy it 6 days a week. I love it and there's a cafe coming soon too. Can't wait. The town of Elgin is a wonderful place to be a farmer right now. We are so excited about all of the other farmers here who are also committed to sustainable and naturally grown food. We have gone through the process of getting approved to sell at the farmers market so now it's a matter of having enough extra to sell to make it worthwhile. I think that will be the case very soon. We are still working on getting the timing down as far as the perfect time to plant certain plants for maximum yield but we are way ahead of where we were this time last year. I think we could have started some things even earlier this year. Much depends on mother nature too and we've been very lucky with a cool summer so far this year. I'm excited about what the fall garden has in store for us. Our next project is an expansion of our planting area. We did great with the small lasagna garden we tried so we are going to sort of expand on that idea using the success that we saw in the movie Back to Eden. It will be a 23x25 foot area so we'll have lots of new area to play in. We are going to put 6 inches of growing mix that we are getting from Lone Star Mulch & Company on top of cardboard and cover that with 2 inches of wood chips. When we plant, we will move the wood chips aside and plant in the growing mix. The quite eccentric and deeply religious, Paul Gautschi is having wild success with this concept and so are others that were highlighted in the documentary. He is also in the Pacific Northwest where everything is very different than central Texas. I'm excited to see how the idea works for us and to share our results with you. Thanks for reading and you can also find us on Facebook for more consistent photos and adventure updates. Back in September I posted about the hard pear cider I made with the pears we got from our trees and I promised to update you about how it turned out. It took until a few weeks ago before it developed into a nice almost sparkling wine. The alcohol content is unclear because I do not have an instrument to test it but what is known is that it will get you buzzed. It turned out dry just like I wanted but it wasn't as carbonated as I had hoped. Overall, it was a success. It tastes really nice over ice. Will I do this with our pears again this year? No. We do not have a cider press so I put all the pears through my green star juicer which look forever and it was a great big mess. I do not plan on becoming more than just a hobby hooch maker so I don't see the benefit in investing in a cider press. When I make it again, I will find a local source of fresh pressed apple cider and start with that. This means we will be eating, selling and probably giving a way a lot of fresh pears in the Fall. I also wrote awhile back about all of the miscellaneous items that we inherited when we moved in. I wanted some help with creative ideas to put this stuff to good use rather than in a landfill. We still have quite a collection of items to put to reuse but we have made progress. Mainly for the world's most interesting chicken coop. Farmer D used most of the old plywood signs to make walls over the insulation in the chicken coop and some old headboards will be filled with plants to help create a beautiful garden that acts as a barrier around the chicken run. There was already a built in shelving unit in the coop so we removed some of the shelves to made nesting boxes. These will make good planters but not for edibles. I have no idea what they were treated with. This is a look at how our chicken run turned out. We split it into 2 sections so we can alternate them between sides. Using all the containers we have to create a garden around the perimeter. Looks like I need some more. When it comes to re-purposing stuff around here, we have a way to go but I have been seeing some great ideas and I have some projects in mind so we will continue to keep you updated. We did get a new treasure that we have made the mascot of our coop. Gidget is depressed. She wanted free range chickens. The chickens are in their new home and loving it. They have plenty of space to say the least. They are 6 weeks old this morning. Griz says, "What? I didn't know we had chickens." While we patiently wait for the chickens to produce some delicious eggs, we'll take a look and some of the other foods we are patiently waiting for. One of the things I'm most excited about are the figs. Last year the tree did not produce very much and what it did produce got stolen by the birds before we were able to get them. This year, we fed the 3 fig trees lots of compost and we have been watering it regularly. The biggest tree has responded in a wonderful way by setting lots of fruit. Gidget doesn't see the allure of figs but she heard me say something about birds so she and Griz are on the hunt. Thankfully the cats aren't very good at hunting birds. They are also not very good at hunting gophers so I'm beginning to wonder what they are good for. Other than figs we have a lot of other foods growing that we hope to eat and maybe share soon. Here's some of the watermelon and corn that we planted a few weeks ago. When we thinned the watermelon, we tried to move the small plants to another location. Don't bother trying that in your garden, just thin them and walk away. Watermelons do not transplant well - or at all. This is suppose to be 3 rows of corn. I don't know why most of the third row did not come up. The tomatoes are growing like weeds and setting fruit nicely. There are also some small sunflowers in this bed that are close to blooming. Here we have some cucumbers and beans in the front bed and bell peppers and cherry tomatoes in the back. The peppers are just starting to bloom and those got sprayed with worm casting tea yesterday. It seems to me that they set fruit better after a foliar feeding with worm tea. We have some zinnias volunteering in this bed along with some butternut squash seeds that we are waiting to appear. Zinnias are such happy flowers. The first corn we planted is moving along nicely. Tassels on our first Fishers Early sweet corn. And the silks are appearing on the cobs that we should be eating soon. There is enough corn in this area that we should not need to pollinate it by hand but I think we may need to intervene with the other bed. The thing we are eating regularly right now is mulberries. They are absolutely delicious. Giving the tree some compost and regular water seems to have made it very happy. Gidget thinks someone needs to get a handle on these gophers, I agree Gidget! Get on it. One of the first things I learned about gardening is that plants will increase growth significantly as temperatures rise. I saw this first hand a little in San Diego during the "heat" of the summer but with the non-existent weather there it wasn't as apparent as it is here. The temperatures in Elgin have been in the mid to high 80s during the day, and in the 60s at night regularly over the last couple weeks and I am absolutely amazed at how quickly the plants are growing. Now I've learned that there is a threshold and at some point the plants will get too hot to set fruit. Timing has become more relevant than it ever was before. Last year we didn't even move in until May 2nd and didn't get around to planting anything until late May or early June . Our results were dismal. It got so hot that we were unable to function outside the comfort of air conditioning and the plants didn't want to perform either. I hope we'll be slightly more acclimated this year. And I hope we'll be eating a lot of food from the garden. Gidget isn't looking forward to summer. She plans to spend a lot of time in her box. We haven't perfected the timing yet but we are certainly doing better this year than last. The tomatoes look good and are setting fruit. I gave them an inch of compost today. And while we're talking about rapid growth, our chicks are getting huge. We're planning to move them to the big chick house this weekend. They will be a month old on the 6th of May. Farmer D worked all weekend long on the chicken house with awesome results! We've got one heck of a unique and functional chicken coop happening. We cleaned out an old shed that was packed with all sorts of stuff the last folks left behind. Then we insulated the interior framing and Farmer D cut and hung old plywood for interior walls. The last folks left a lot of plywood that was painted up as signage. Walls insulated and plywood hung. The chickens have some interesting reading. My favorite part is the little chicken door and ladder that Farmer D built. We're going to split the interior into two parts because it's a lot of space for 7 chickens. It will make it easier and less expensive for us and the chickens will still have plenty of room. Then we will fence an outdoor run to protect the chickens from predators while they're outside. It will have two sections that we'll alternate. Other than that there isn't much to tell you about. We've been watering regularly, spreading compost, spraying worm tea, harvesting mulberries which are delicious, thinning seedlings, weeding and planning. We're always planning. We have carrots, potatoes, peas, tomatoes, peppers, corn, beans, pumpkins, watermelon, sunflowers and more in various stages. We will do more planting over the next week or so but only certain crops like beans, chard, pepper plants, zinnias, sunflowers and a couple others. Then it will be all about maintenance. We will be able to set up the automatic watering system soon because we won't have so many different stages of plants growing on. It's incredible how quickly our spring is passing while so many other gardeners around the country are still frozen or barely thawed. The Travis County Planting Schedule has been a huge tool for me this season. Gidget is almost happy about her chickens but remains skeptical about our plans for her garden. Crystal Montoya. Theme images by dfli. Powered by Blogger.